PARSIPPANY, NJ--(Marketwire - Sep 10, 2012) - Wyndham Hotel Group, a member of the Wyndham Worldwide (NYSE: WYN) family and the world's largest hotel company with over 7,170 hotels around the globe, today announced the opening of the Ramada Encore hotel in Guadalajara, Mexico, its 100th property in Latin America. Wyndham Hotel Group is strategically expanding its footprint in the region, focusing its efforts in key markets including Mexico, Brazil, Colombia, Peru and Panama. 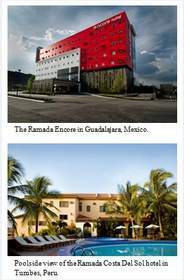 With the addition of the Ramada Encore Guadalajara, the company now boasts over 12,000 rooms in Latin America associated with the Wyndham® Hotels and Resorts, Ramada®, Days Inn®, Wingate by Wyndham®, Microtel Inn & Suites® by Wyndham, TRYP by Wyndham(SM) and Howard Johnson® brands. Wyndham Hotel Group reached this important milestone, in part, by developing strategic relationships with existing portfolios and established national hotel chains. Earlier this year, the company announced an agreement with Hoteles Costa del Sol to franchise three new Ramada hotels throughout Peru in Cusco, Tumbes and Chiclayo. Wyndham Hotel Group also entered into an agreement with Brazilian-based real estate company, EmCorp, to launch 20 properties across Brazil under the Wyndham® and Super 8® brand product offerings. This summer, the company also introduced the TRYP by Wyndham brand in Panama with the newly constructed 92-room TRYP by Wyndham Panama Centro that opened in July 2012. It is the company's first managed hotel in Latin America. "We are very excited about the growth of our brands in Latin America since they align with the needs of the growing middle class and the increase of international travelers to the region," said Daniel del Olmo, Wyndham Hotel Group's SVP and managing director of Latin America. "In fact, the region now has the highest pipeline percentage growth within Wyndham Hotel Group. With 15 renowned hotel brands ranging from economy to upscale to extended stay, we provide travelers with the right hotel for their travel experience and developers with flexibility and an appreciation of their local environment." The Ramada Encore Guadalajara, located in the fastest growing commercial and industrial metropolis in Mexico, is a smartly designed 130-room hotel which provides free wireless internet access, complimentary continental breakfast, 24-hour complimentary business center services, lounge area and fitness facility. Offering contemporary accommodations, guests at Ramada Encore hotels enjoy distinctive features such as stylish wooden floors in all guest rooms, innovative bathroom pods featuring a walk-in power shower and The HUB, the Encore tier's signature multipurpose space where guests can eat, work or relax. Wyndham Hotel Group is the world's largest hotel company with over 7,170 hotels and approximately 608,300 rooms in 66 countries under the hotel brands: Wyndham® Hotels and Resorts, Ramada®, Days Inn®, Super 8®, Wingate by Wyndham®, Baymont Inn & Suites®, Microtel Inn & Suites® by Wyndham, Hawthorn Suites® by Wyndham, TRYP by Wyndham(SM), Howard Johnson®, Travelodge® and Knights Inn®. In addition, the company has license agreements to franchise the Planet Hollywood Hotels, Dream® and Night® brands and provide management services globally. EDITORS: High-resolution versions of the above images may be downloaded here. Additional photos and logos can be downloaded from the Wyndham Worldwide Media Center, available here. For more information about Wyndham Worldwide Corporation and its businesses, go to www.wyndhamworldwide.com.